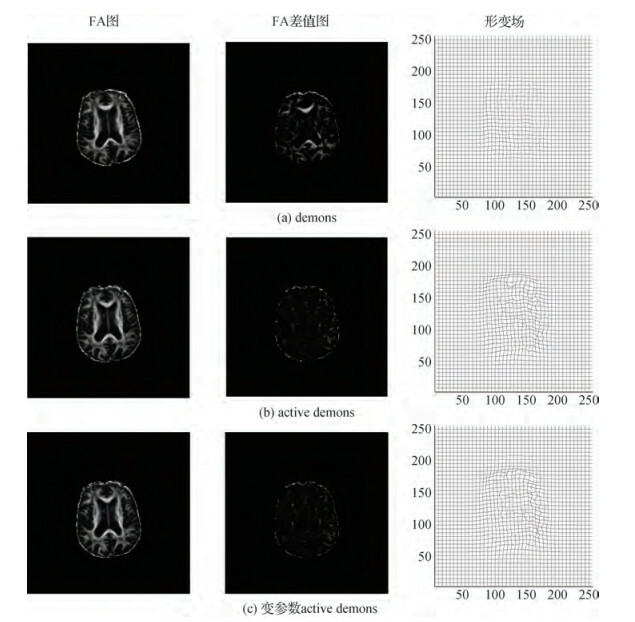 Objective Diffusion tensor imaging (DTI) is widely recognized as the most attractive non-invasive magnetic resonance imaging method. DTI is sensitive to subtle differences in the orientation of white matter fiber and diffuse anisotropy. Hence, it is a powerful method studying brain diseases and group research, such as Alzheimer's disease, Parkinson's disease, and multiple sclerosis. DTI registration is a prerequisite for these studies, and its effect will directly affect the reliability and completeness of the follow-up medical research and clinical diagnosis. 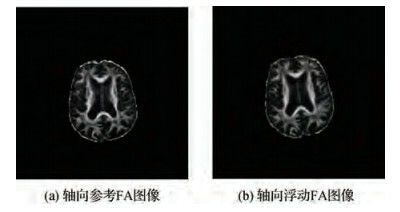 DT images contain many information about the direction of brain white matter fibers. DTI registration not only requires the consistency of the anatomy between the reference and the moving image after registration but also demands consistency between the diffusion tensor direction and the anatomic structure. 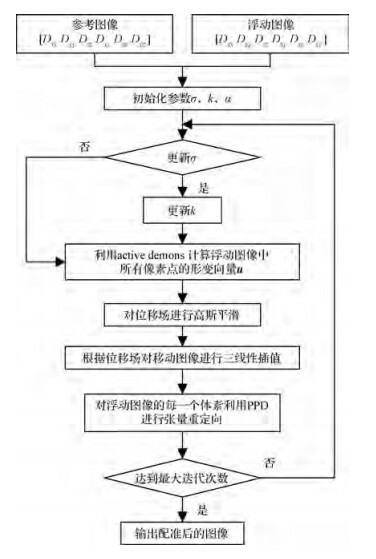 The DTI registration based on demons algorithm, which uses the six independent components of the tensor as inputs, can fully use the direction information of the diffusion tensor data and improve the quality of registration. However, this algorithm does not perform well in the large deformation area, and its convergence speed is slow. The active demons algorithm can accelerate the convergence to some extent, but the internal structure of the moving image is prone to being teared, deformed, and folded due to the presence of false demons force, which can alter the topological structure of the moving image. To solve these problems, this paper proposes a multi-channel DTI registration method based on active demons algorithm by using variable parameters. Method The active demons algorithm is introduced into the multi-channel DTI registration. By analyzing the influence of the homogeneous and the balance coefficient in the active demons algorithm on the DTI registration and combining the advantages of the balance coefficient of improving the convergence speed and that of homogeneous coefficient of enhancing the accuracy of the multi-channel DTI registration, an appropriate homogeneous coefficient is first manually selected in a reasonable range. 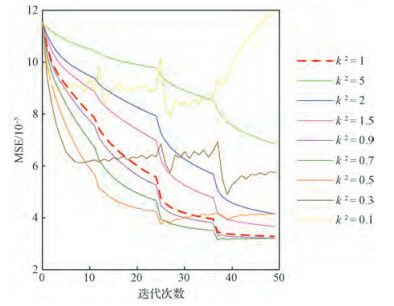 Then, the size of the balance coefficient value is dynamically adjusted with the decreasing Gaussian kernel during the convergence of this proposed algorithm. A smaller balance coefficient is used in the initial stage of DTI registration for a faster convergence speed, and then the balance coefficient is gradually increased for a smaller registration error. 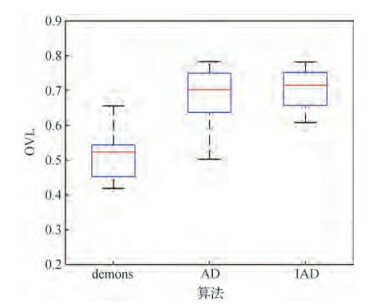 To verify whether the proposed multi-channel DTI registration method based on active demons algorithm using variable parameters statistically improves the effect of registration compared with the demons and active demons methods, 10 pairs of DTI data volumes of patients with Alzheimer's disease are used for registration. The mean square error (MSE) and overlap of eigenvalue-eigenvector pairs (OVL) obtained from the three DTI registration methods are used for the paired $t$ test. 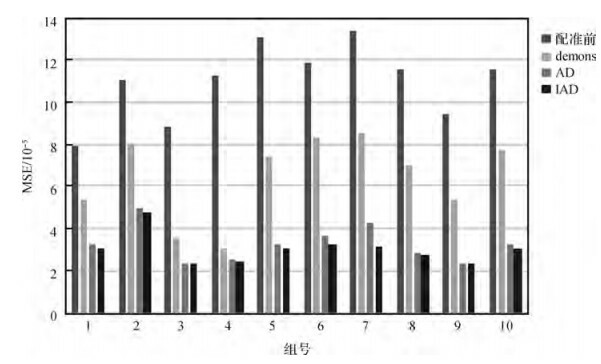 Result When the demons algorithm is used for the multi-channel DTI registration, a good registration effect is achieved in small deformation areas. However, the registration effect in larger deformation areas is not ideal and the convergence rate is slow. 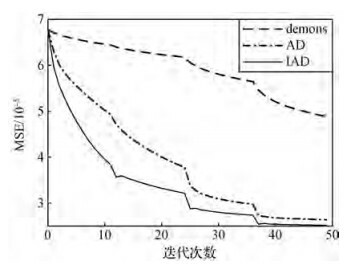 The homogenization coefficient in the active demons method for DTI registration resolved the registration problem in large deformation areas, but the image topology will change if the homogenization coefficient is too small. Although a faster convergence can be achieved by fixing the homogenization coefficient and introducing a single balance coefficient, the topological structure of the image changes simultaneously. Compared with the DTI registration method based on demons and active demons algorithm by using multiple channels, the convergence speed of the proposed approach is increased, the registration effect in large deformation areas is significantly improved, and the topology consistency of the image is preserved before and after registration. Moreover, the minimum MSE and maximum OVL values are obtained after registration using the proposed method for 10 sets of DTI data. 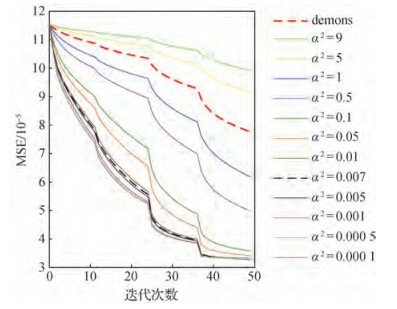 At the given level of significance of 0.05, a significant difference can be found in the MSE values and OVL values between the active demons algorithm using variable parameters and active demons algorithm and between the active demons algorithm using variable parameters and demons algorithm ($p$ < 0.05). 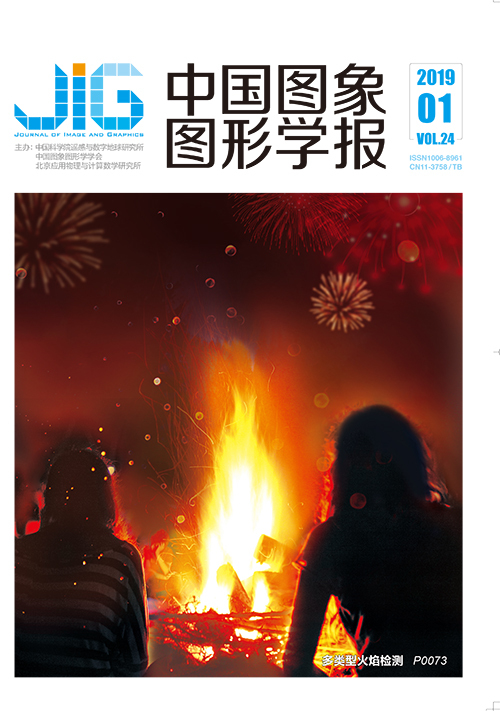 Conclusion The application of variable parameters in the proposed DTI registration method not only effectively improves the registration accuracy and registration speed but also enhance the registration of large deformation areas of DT image by the demons algorithm. It maintains the topological structure of DT images before and after registration simultaneously, which is one of the major drawbacks in multi-channel DTI registration method based on active demons algorithm. 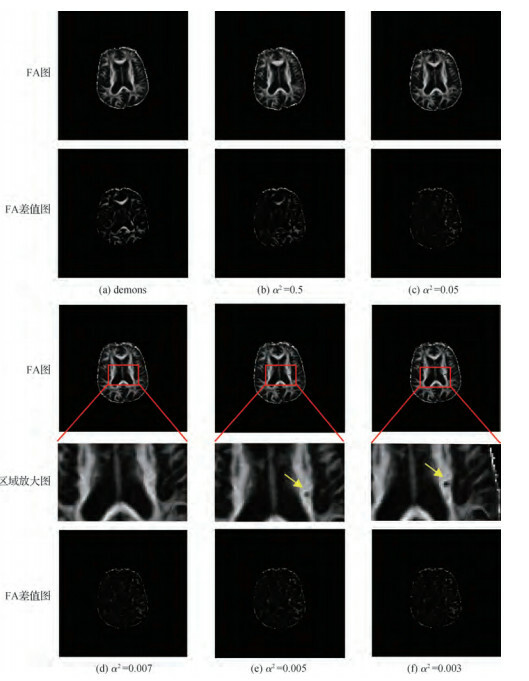 The experimental results indicate that a multi-channel DTI registration method based on active demons algorithm using variable parameters is suitable for the registration of DT images with large deformation areas between individuals.